Messana Radiant Cooling headquarters being moved to a new location. The new manufacturing facility is a bout 40,000 sq.ft. and includes a new radiant gypsum panel state-of-the-art production plant, warehousing and a new modern office area of about 6,000 sq. ft. with R&D, administration and sales. The new production line will be fully functional by the beginning of September. While the new office will be operative starting by the end of September. 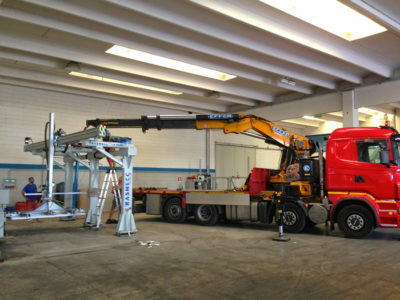 The picture shows the last piece of the production line being taken away with a crane. Hey Guys, you are doing a tremendous job! Your American cousins look forward to visit the new European Headquarters.. soon.